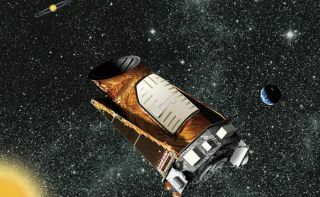 Fourcenturies after Johannes Kepler first described how planets orbit the Sun,NASA?s Kepler mission launches in search of Earth-size planets around distantstars. Kepler willseekevidence of planets by observing more than 100,000 stars continuously,looking for the tiny dip in brightness caused by a planetary transit. I?m surethat Johannes would be amazed; I know that I am. The launch is scheduled from CapeCanaveral, Fla., at 10:48 p.m. EST on Thursday, March 5. That?s one week fromnow, and the countdown in underway. The excitement is palpable. Kepler isthe first spacecraft capable of discovering Earth-size planets in the habitablezone of distant stars. ESO?s COROT spacecraft is finding ?super-Earths? whichare planets several times the mass of Earth. COROT?s planets are in shortperiod orbits, which means that the planets are close to their stars and arehigh temperature orbs. The latestCOROT discovery is roughly twice the size of Earth. Ground-based telescopessearch for exo-planets using spectroscopy, and have discovered a bounty ofgiant planets. More than 340planets have been discovered, including 37 systems with multiple planets.Altogether, planets have been found orbiting more than 280 nearby stars.Amazing! So far, planetsas small as Earth have not been found. The Kepler mission is specificallydesigned to search for Earths in the habitable zone of other stars. This willtake time. One transit is not sufficient. Discoveries must be confirmed by atleast two additional transits, for a minimum of three transits. For a planetlike Earth in orbit around a Sun-like star, the transits would be about a yearapart. Thus, confirmation would require three years. The initial observationperiod for Kepler is 3.5 years, and it may be extended. BillBorucki, the Principal Investigator for the Kepler mission, has worked on theidea of finding Earths for more than 20 years. At first, he had to convinceNASA that seeking small, terrestrial-type planets using the transit method wasfeasible. Could equipment be designed and launched that could actuallyaccomplish the very precise observations needed to detect small planets?Borucki and his team proposed the Kepler mission four times to the DiscoveryProgram. Following the third proposal in 1998, Dave Koch the Deputy PrincipalInvestigator was granted research funds to build a CCD camera and Bill Boruckiwas granted funds to build a testbed. Together they formed the proof ofconcept. They built a physical simulator in the labs at NASA?s Ames ResearchCenter and successfully demonstrated that the transit method could detectEarth-size planets. In the next round of Discovery proposals, two years later,the Kepler Mission made the first cut and was ultimately selected in December2001 as the tenth Discovery mission.? Today, a large team of scientists andengineers at NASA Ames Research Center, Jet Propulsion Laboratory,non-profit organizations (including the SETI Institute) and severaluniversities are working together on Kepler, which was constructed by BATC (Ball Aerospace& Technologies Corporation) in Boulder, CO.
Next week,Kepler launches. Of course, the big question is whether ?Earths? are common orrare. We don?t know, but the Kepler mission should be able to answer this question.You can follow the mission via the NASAwebsite as we seek other worlds that could be like our own.